How to Build a Culture of Empathy: Sub Conference: Pathologies Sociopathy, Psychopathy, Narcissism, Schizophrenia, Personality Disorders, etc. 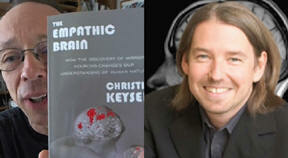 Christian Keysers is professor and group leader of the Social Brain Lab at the University Medical Center Groningen in the Netherlands. The lab explores the biological nature and neuroscience of empathy. Christian is author of 'The Empathic Brain: How the Discovery of Mirror Neurons Changes our Understanding of Human Nature'. Tim McGregor has worked as a practitioner in the UK addiction treatment sector for over 20 years. Tim founded Substance Misuse Solutions Ltd, that involves consultancy work and commissioning advice on drug and alcohol treatment. He is coauthor with Jane McGregor of The Empathy Trap: Understanding Antisocial Personalities. Jane is a lecturer at the Institute of Mental Health, University of Nottingham, UK. "Sociopathy affects an estimated 1-4% of the population, but not all sociopaths are cold-blooded murderers. They're best described as people without a conscience, who prey on those with high levels of empathy, but themselves lack any concern for others' feelings and show no remorse for their actions. Drawing on real life cases, The Empathy Trap explores this taboo subject and looks at how people can protect themselves against these arch-manipulators." Abigail Marsh is a professor at Georgetown University. Her area of expertise includes social and affective neuroscience, particularly understanding emotions such as empathy and how they relate to aggression, altruism, violence and psychopathy. Her research is aimed at understanding aspects of human social interactions, emotional functioning, and empathy using cognitive neuroscience methods, with a particular focus on emotion and nonverbal communication. Her research also includes studies with adolescents and adults that incorporate neuroimaging, cognitive and behavioral testing, and pharmacology techniques. Abigail also teaches a course titled Empathy, Altruism, & Aggression. The course addresses such questions as; Are humans innately selfish or empathic? What do we mean when we say empathy? Do selfish or empathic behaviors succeed best in the long term? What is a psychopath? He says there are two type of empathy, one is 'cold empathy', it's metaphorically like a library of books with no emotion. Psychopaths & Narcissists have this quality of empathy but do not see (or care) how their actions affect others.